The Dáil has voted to join the European Union's Permanent Structured Co-operation Agreement. The decision to join PESCO was passed by 75 votes to 42. In commending the Government motion on the proposed approval of Ireland's participation in Permanent Structured Co-operation, the Tánaiste and Minister for Foreign Affairs told the Dáil it would enhance the capability of UN-mandated missions engaged in peacekeeping, conflict prevention or the strengthening of international security. 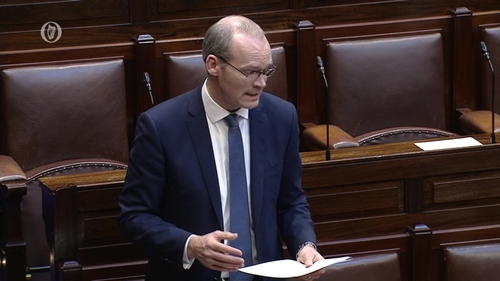 Simon Coveney said all members of the Oireachtas were extremely proud of the contribution by Irish Defence Forces in supporting international peace and security. He said participation in PESCO would allow them gain access to the best equipment and training. Fianna Fáil supported the Government in its view, and the party’s defence spokesperson told the Dáil that working with other member states would "leave us safe in the knowledge that we are providing the most up to date training that we can for our Defence forces". Lisa Chambers disagreed with the views of opposition deputies, who raised concern over not getting an opportunity to brief themselves properly on PESCO, or to discuss the matter. She said having briefed herself on the matter she was of the firm view that it was a good idea. Sinn Fein TD Aengus Ó Snodaigh described Ms Chambers contribution as simplistic "claptrap". He said the history of the Defence Forces has been historical and he offered to give the Fianna Fáil history lesson on the matter. He said the suggestion by the Tánaiste in relation to Ireland signing up to PESCO came out of the blue. He said the independence and sovereignty of Ireland was being undermined. Labour TD Brendan Ryan said the matter was too important for a vote to be rushed through the Dáil. He described the deadline as "false" and pointed out that the Labour Party had requested a debate on the matter last June. Meanwhile People Before Profit/Solidarity TD Richard Boyd Barrett said the Government was "pulling a fast one" and accused Fianna Fáil of colluding with them. He said it was unconstitutional and an abandonment of Ireland's neutrality. He said the opposition may challenge the matter on constitutional grounds. Yesterday, TD Mick Wallace said if Ireland joins the EU military force it will the final nail in the coffin of Irish neutrality. Speaking during Leaders Questions, the Independents 4 Change deputy wanted to know what the big threat that the country faced which required us to sign up to the group. He said PESCO was, in effect, an EU army. He was also highly critical of the lack of debate and public awareness of the Government's plans to sign up. It would require a commitment to increase spending on our defence forces at a time when we cannot even pay its members a proper wage, he said. In response, the Taoiseach said that for far too long Europe had relied on the US for its defence and that had to change. PESCO, he said, would allow Europe to take control of its own defence. Like other neutral countries such as Austria, Finland and Sweden, Ireland would be joining on an "opt in, opt out basis," Leo Varadkar said. "That would allow Ireland to join elements of PESCO that were beneficial such as counter-terrorism, cyber security and peace keeping," he said. "What we are not going to be doing is buying aircraft carriers and fighter jets," the Taoiseach told the Dáil.